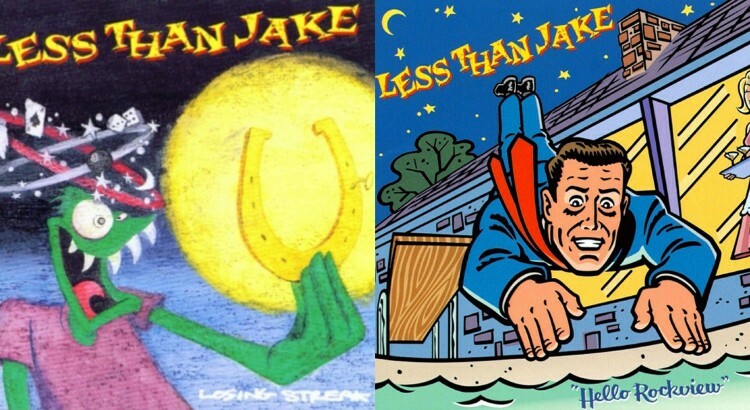 Gainesville ska/punk band Less Than Jake has announced they will repress two of their most popular records on vinyl. Their 1996 release “Losing Streak” had its first vinyl pressing in 1998 but, according to the band, has been out of print for over a decade. 1997 fan favorite “Hello Rockview” went to vinyl the same year. Both have been fairly hard to get a hold of for collectors that didn’t grab them on the first pressing. Both records will be released in a variety of colors, though many color varieties are but they’re already sold out, even though they only went on sale a few hours ago. They’re both priced for pre-order at a very reasonable price of $16 each. Buyers should note that they won’t ship until May. “Hello Rockview” ships with a comic book as the original CD did. The band is advertising the comic as “Full Size,” does that mean it’s a 12-inch square comic!? You can purchase this vinyl score directly from Less Than Jake via Limited Run. They’re already sold out. Less than 8 hours after the email went out, before we could even click publish, these records have been sold out. Sorry, folks. They only pressed 1,000 of each record (or 1,000 total) so it really wasn’t going to take long. Both individual product pages have links where you can sign up to get notified if more copies become available: Losing Streak and Hello Rockview. For those keeping track, this year will mark the 20-year anniversary of “Losing Streak.” In honor of the occasion, the band is doing two-night runs in a handful of cities playing full albums each night, “Losing Streak” and “Hello Rockview.” The closest they get to town is New York on March 9 and 10 and both dates are already sold out. The band last passed through Boston in January 2015 so they’re about due for another visit. Track 7 off of “Hello Rockview” and one of my personal favorites.